The team’s findings are notable for reasons that go beyond mesothelioma and asbestos. Among other things, the findings are relevant to consideration of molecular level events that do (or do not) occur following mutations that could arise from intake of various compounds or toxins. The findings also expand on the team’s previously reported findings as to BAP1, asbestos and mesothelioma. “Dr. Carbone and colleagues] have discovered why people carrying mutations in a gene called BAP1 are much more susceptible to asbestos, sunlight, and other environmental carcinogens. They also found that cancer cells with a BAP1 gene mutation are resistant to chemotherapy, and that about 20 percent of all cancers harbor BAP1 mutations. The findings published in Nature highlight how the BAP1 gene regulates a channel (IP3R3) inside cells that moves calcium. When the BAP1 gene is mutated or damaged, calcium levels inside the cells decrease. The decrease of calcium makes cells more likely to become malignant when exposed to environmental carcinogens. The molecular level results shed further light on development of cancer and build on many prior studies by Dr. Carbone and his colleagues on the role of BAP1 mutations in the development of mesothelioma and other cancers. In prior papers, the group had shown that a “normal” supply of the protein generated from the BAP1 gene is necessary for “normal” DNA damage repair. In the most recent paper, Dr. Carbone and colleagues showed further specifics about the role of the BAP1 protein as related to mutated cells. The newer experiments establish the BAP1 protein’s role in the cellular process known as apoptosis, also referred to as programmed cell death. Apoptosis is one of the cellular surveillance mechanisms by which multicellular organisms screen for and eliminate defective (mutated) cells to prevent the possibility of unrestrained tumors growth. The apoptosis process involves a number of steps, including: (1) detecting the cellular defect; (2) determining it to be irreparable; and then (3) initiating a multi-protein signaling cascade to trigger the “death” program carried by all cells. Because all cells carry the “death” program, groups of proteins tightly regulate the process so that superficial defects will not lead to unnecessary cell death. The tightly regulated nature of the apoptosis process is illustrated by the work of Dr. Carbone and colleagues. In a series of elegant experiments, they investigated events that occurred (or did not occur) in cells receiving variable amounts of BAP1 protein. The experiments showed that cells with relatively low amounts of BAP1 protein were less apoptosis “competent.” This means the biological systems of persons carrying a defective BAP1 gene are in general less able to successfully use the apoptosis process to clear away defective cells. This outcome produces adverse effects in the body because if defective cells are able to replicate without being stopped by the apoptotic process, they could evolve into immortal cancer cells that can form a tumor. This study further confirms earlier findings that somatic BAP1 mutations (after conception) are prevalent in many cancers, and may arise after “exposures” to substances that may initiate processes that generate mutations. In view of this new knowledge of the role of BAP1, it becomes more logical for lawyers to investigate the entire exposure history of individuals with a BAP1 mutation. A broader level of investigation is pertinent to establish the entire landscape of possible/likely factors in disease causation. In addition, the new knowledge about BAP1 illustrates why lawyers will want to investigate for mutations in multiple genes. BAP1, after all, stands for “BRCA Associated Protein 1,” an oblique reference to the fact that the proteins from the BRCA genes can operate in tandem with BAP1 proteins. 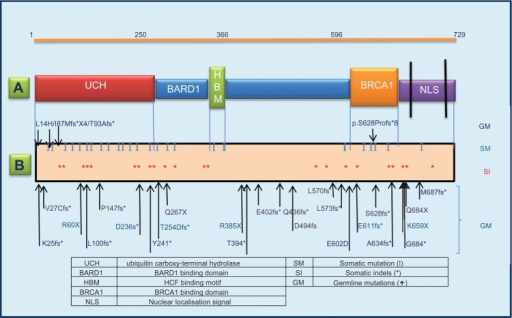 Accordingly, there are reasons to explore the results when a person harbors defects in BRCA1 and/or BRCA2, in addition to mutations in genes such as BAP1 and/or TP53. In turn, courtroom arguments will evolve as researchers expand our understanding of cancer biology and the consequences of inherited (germline) mutations. Almost every week, the ongoing revolution in molecular biology provides new knowledge about the factors that are part of developments in various cancers that will have a dramatic impact on toxic tort litigation like cases involving asbestos exposure. The results of Dr. Carbone’s experiments are a prime example of new knowledge. In turn, new knowledge leads to new questions and hypotheses. These findings are particularly intriguing in light of a recent motion filed by defendants in the NJ asbestos docket asking the Court to compel plaintiffs to submit blood samples so that experts can perform genetic testing. Lawyers, courts and others need to acknowledge the speed and pace of change, and track the ever-changing big picture of knowledge about the mechanisms that underlie cancer.